One of the oldest misunderstandings about racism (and bigotry in general) is that it must be explicit to exist. If you are not walking around in a clan robe or posting swastikas on your facebook profile, you must not be racist. If you are not explicitly stating that black or brown people are less intelligent, or aggressive, or lazy, etc. by nature, you are not a racist. But it's easy to write them off as "one of the baddies" because they are honest and explicit about their racism. But what if they didn't? What if they said the same things, posted the same pictures, and advocated for the same policies? The modern Republican party is filled with people who do just this. None of them admit to explicit racism, yet say, post and advocate for policies that are identical. In the past couple of days, Trump calls Rep. 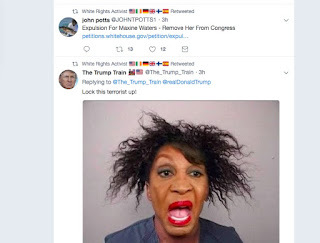 Waters "low-IQ". Huckabee tweets scary picture of MS-13. Rep. King tweets picture of immigrant kids and brings up MS-13. Andrew Sullivan decries the demographic change that (brown) immigrants will bring. All the while actual policies are being enacted that are extreme violations of human rights. I could go on, and on, and on. But there's really no need. The point is that racism does not need to be explicit to exist. It can smolder slowly, softly in the background, a quiet voice that whispers the same old song: fear them, distrust them, they are less important than you. It can always be plausibly denied. Each instance merely a hint. But when you take a step back, line up the comments, line up the images, perspectives and emphasis, a pattern emerges that cannot be denied. It is a cacophonous beast that is well alive and snorting within the hearts of our fellow Americans. the way you fumbled through Aisle 2.
those things he did to you. each breath a cosmic thread. you'll have forgotten to take the time. drift in and out of view. Strangers fill in here and there to make things rhyme. "I don't read the reviews", someone once said to you. you say as you watch the falling rain make the ink run. a star not unlike the sun. It occurred to me that it might be interesting to observe the correlation between voting patterns and ethnic geographic integration. The results are not going to be completely in-obvious. As we all know, there is a deep partisan divide between rural and urban regions. Given that urban areas are more diverse than rural areas, one might expect to see a similar partisan pattern. I browsed google for a bit but didn't come up with anything quickly. However, I did come across this from 2015 in the NY Times. 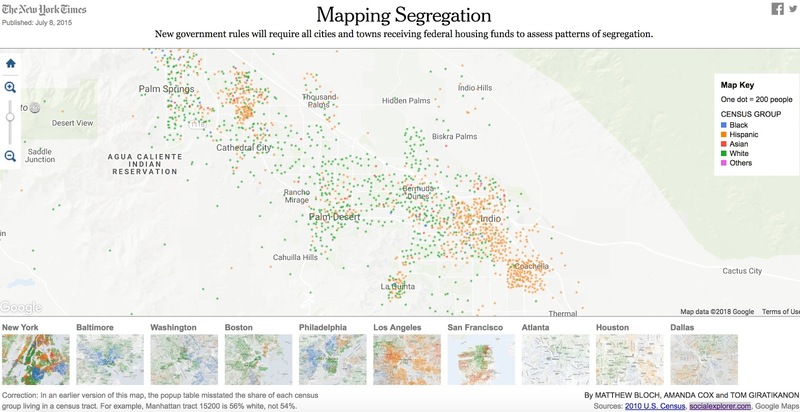 A project called "Mapping Segregation", it is a tool that allows you to view geographic maps of the US by ethnic concentration. It's quite fascinating. Noting one of the sources, "socialexplorer.com", I'm off to gather more data in hopes of creating some of my intended weights. Wish me luck. On the podcast To the Point today, Warren Olney interviewed Ibram Kendi, who had an op-ed in the New York Times recently titled The Heartbeat of Racism is Denial. I took issue with very little of what he said. But near the end of the conversation, he made a statement reflective of a common view among my fellow leftists. This is the false dichotomy I've been decrying on this blog for years, and unfortunately informs a view shared by both the right and the left when discussing racism. Minority disparities are either genetic or caused by racist policy. The right-wing response is to argue that because very few people are explicitly racist, and no explicitly racist laws are on the books, that the cause must be be black people themselves. However, they don't want to admit to any genetic inferiority, so instead say it is "cultural". The left wing response is to agree that no genetic inferiority exists, but that no "cultural" problem exists either. Instead, the answer must be racism. Now, there are at least three words that need unpacking here: racism, culture, and policies. Because each could be interpreted different ways. Racism could mean explicit, active racism (not hiring a black sounding name, not moving to a black neighborhood, etc.). But it could also be passive (not supporting policies with disparate impacts, not feeling as "generous" towards minorities, developing prejudices, etc.). But it could also be historical racism, which is not currently active, yet has previously occurred and left a mark (discriminatory hiring, policing, red-lining, etc. could have happened a generation ago yet still be impacting family members today). Or it could be all of the above. Culture could mean the customs and traditions of an ethnic group (music, dance, conversation, style, etc.). But it could also mean micro-level or family or neighborhood level norms (not cleaning up trash, engaging in risky behaviors, not doing schoolwork, etc.). The latter type of culture is trans-ethnic, meaning it is less reflective of any particular ethnic group than a segment within that group, usually relating to class or privilege. Policies could mean explicit laws pertaining directly to skin color, enacted for racist reasons, which actively target certain ethnicities for persecution (colored bathrooms, schools, profiling, etc.). But they could also mean policies that create implicit effects through inaction, which cause disparate impacts. For example, if majority minority neighborhoods are located next to polluting factories, and you pass laws eliminating regulations, the law is not explicitly discriminating, but the impact will be. Now, to use the terms racism, policy and culture loosely is to cut conversation off at the kneecap. And yet this is exactly what we tend to do. I would argue that most conversations on race, policy and economics involve incredibly loose use of these terms. Even when the subject is broken down, as Kendi did in the interview, his use of the term racism and policy were too loose as to be meaningful in any deeper, more functional way. Because if we are ever going to get anywhere in understanding the divide between right and left on racism and poverty - two fundamental problems of history itself, and to come together in our understanding of truth, we are going to need to dig into the weeds of what these ideas mean. As readers of this blog will note, the question of why we behave the way we do is incredibly complex from an epistemological standpoint. And how are we ever going to get to that if we can't agree on common language? Furthermore, how are we going to take steps to solve the problem if we don't know how to properly discuss it in an objective, orderly fashion? Coates is again in the news as Cornel West takes him to task for his neoliberalism. A portion of West's thesis deals with Coates' embrace of Obama, including the imperialism he finds distasteful. While germane to a definition of neoliberalism, I'm personally more interested in how the two deal with minority poverty. As a white man, I recognize the privileged view from which I sit. However, with decades of work among poor and minority communities, and a life-long grappling both (literally and figuratively) with how to help understand and solve the wealth gap, I feel my critical engagement with these issues comes from a place of deep respect. Further, I continue to feel that true anti-racism requires humanization, not objectification of minority thought. That said, I welcome critique of my ideas should they veer towards offensive caricature, or any other reflection of my whiteness. But onwards. Critiques of West have been that he is too ad hominem - arguing Coates' hasn't "earned" the right to his pessimism. That can be read as such - shouldn't Coates' arguments be taken on their merit, as opposed to the body that voices them? But one could read West not as impugning Coates' personally, but rather - again in line with West's thesis - his lack of a developed theory of oppression. West is a Marxist, and places oppression in the context of an accumulation of wealth and power that is explicitly capitalist. Coates spends very little time with this. Coates' paints vivid and beautiful portraits of what oppression feels like. And this is to be admired greatly. And his effect has been great. But much of this effect, arguably, can be attributable to his resonance with Whites' deep ambivalence between their neoliberal assumptions and their discomfort with their obvious privilege. Coates paints a vivid portrait for them to hang on their wall, to give passing penance. But nothing else about the room is required to change. The walls of the building remain. My problem with Coates’ neo-liberalism is that it rests snugly in the neo-liberal Whites’ allergy top real economic reform. If it is all about racist white behavior, then you don’t have to deal with the deeper economic assumptions that literally perpetuate minority poverty. Whites are, have been, and likely be racist in all kinds of ways. But imagine if you got them all to stop tomorrow: what would that really change about minority poverty? We have an economic system which requires low-skill labor be paid low wages. This means historically marginalized groups will inevitably be the ones doing that work. Neo-liberals assume that if you simply make the playing field equal, that society with be equal. But capitalism simply doesn’t work that way: it REQUIRES an underclass. Take Coates’ reparations - I’m all for them, but they don’t demand better pay for low-skill work. In fact, the neo-liberal assumption of a meritocracy in which everyone gets a good education and goes to college, ACTIVELY undervalues and views moral failing in the poor. Yet when the poor make bad choices, don’t raise their kids right, misbehave, etc. - neoliberals have no answer other than to pretend it doesn’t exist and that the problem is not the system but rather white racism. What they cannot or will not grasp is that capitalism depends on a caste system of societal capital, in which financial, emotional, cognitive, neighborhood, property, etc. resources are leveraged by market values. These market values don’t care a whit about the immorality of privilege and historical advantage. It depends upon the individual acting according to self-interest, which will always be stronger than group interest unless larger contingencies are in place. The strongest contingency of all is a system of laws that grant privilege status to property above morality. Thus, high-SES and low-SES is allowed to exist. Of course race will be a factor in this, but it is only the language that the system uses to describe the violence that the economic system perpetrates. West’s critique of Coates is that he is “all talk” in this sense - that he revels in the language of racism without looking deeper, into its economic grammar, if you will. In my intellectual evolution over the years (documented for better or worse on this blog! ), I've come to develop the notion of something I call Societal Capital. Its an extension of the Marxist notion of the leveraging of capital in a capitalist society, but reaching more broadly to include not only financial but other forms of material wealth that can also be seen as commodities. Essentially, anything that can be leveraged to help one develop for themselves more freedom is Societal Capital. Likewise, the lack thereof of this development act to deleverage one's freedom. For example, when a parent reads to her child and engages her in stimulating conversation, she improves the child's cognitive capacity, which the child will be able to leverage for increased access to freedom in school and peer relationships. Similarly, the way a parent smiles at her child, hugs her and comforts her builds up a child's emotional strength, which then she will be able to leverage outside the home. The notion of Societal Capital is Marxist in that it eschews the static notion of libertarian free will that is presumed by classical liberalism. Supporters of a "free market" imagine in individuals as free actors; if people are free to make decisions, all things being equal they will thrive according to their merit. An inherent morality is thus derived in which personal circumstance is largely the product of one's "personal freedoms", without regard to past or future learning histories. The ultimate product of this view is that people who don't do well in school, seek to better themselves, stay in low-wage jobs, or generally make choices that are less productive, have no one to blame but themselves. This presents a problem for neo-liberalism, which fundamentally accepts the notion of merit and personal responsibility. But hold on a second, you might say - I'm a Democrat and I don't blame the poor! Enter Coates and West. I first began reading Coates many years ago, when he used to blog for the Atlantic. I was interested in his take on education, especially how it intertwined with race. But I grew frustrated with his embrace of ed-reform (a movement rooted in neoliberalism's assumptions), and the picture he painted of "poor" schools did not reflect what I knew to be the case - both from research as well as first hand experience in the classroom. More so, I was annoyed with the what White readers - most of whom likely never spent much time in a ghetto in their lives - seemed to conveniently elevate him. Sure, there were racist teachers - I'll never forget one in PA who whispered a complaint to me about the "black ones". But sadly, the racism in her words was not in the facts of the case, but rather her interpretation of them. In Reading, PA, schools were filled with poor, misbehaved children. And there, as is the case everywhere in America, a higher proportion of misbehaved kids were indeed minority, especially black. But the racism dripping from her white lips was that she put the blame squarely ON THEM. She did not understand the context of what she was seeing. She did not see the historical marginalization, the wealth gap, and ultimately that poverty, not race was the determining factor in the behavior that she loathed. And as a teacher, you can only imagine how infuriating poorly behaved, disrespectful, sassy, unmotivated children can be. But poor white kids were hardly better (owing to their small privilege of being white and the modicum of Societal Capital that had allowed their family to maintain). When I finally left the profession, it was because I simply could no longer take the daily confrontation of poor kids with no support in the rest of their lives. I would end the day with a stack of notes to call home. When I phoned, their parents had long given up on them, and had no advice for me. These parents did not have enough support themselves. And in Yucca Valley, CA, they were primarily white. For decades now, since explicit racism has been written out of the lawbooks (segregation, miscegenation), and society has generally embraced the notion that all races should be in theory treated fairly, the persistence of the minority poverty gap has presented a problem for mainstream political thought. The conservative Republican party views the problem as classical liberals might: free will in minority communities necessitates that the problem is individual. Far right racists say this is biological, less far-right race "realists" say it is cultural. The problem is not, that is, due to racism or economic structure. The liberal Democratic party is too politically "liberal" (i.e. moderately progressive), to directly challenge the classical liberal assumptions of capitalism such free markets, property rights and individual freedom of action (free will). Instead, (especially after the horrific example of communism's form of dismantling these assumptions) it has chosen to delicately tip-toe around these notions, avoiding direct confrontation. Government is sold as a salve in the rougher edges of capitalism. Supports such as public education and health care subsidies are promoted as morally necessary when individuals are unable to obtain services such as education and health care on the free market. But when faced with the persistence of minority poverty, they are ill-equipped to confront the problem directly. To challenge racism is old-hat. This requires no actual challenge to any real norms. Be nice to everyone and treat them with respect. OK, fine. We've all agreed that this is what you are supposed to do. Of course, people are going to be racist in all manner of micro-aggressive, ignorant and mildly ugly ways. But undoing any of this, no matter how hard we try, is... well, lip-service. Generational poverty is a product of capitalism. If we take race out of the equation altogether, you still get economic segregation and broken communities, for the simple fact that low-wages inflict a violence upon families that is beyond compare. It creates stresses, hardships, and instabilities that devastate Societal Capital. It creates ghettos bereft of public capital such as parks, clean streets, role-models, nice stores, good transportation and basic safety. It saps family capital as marriages are strained and children grow up unsupported. Emotional and cognitive capital is deserted in early childhood, leading to schools filled with children far behind their higher-wage family peers. Educational capital is thus hamstrung as the school-to-poverty pipe-line is reinforced. Hope is depleted, short-term is prioritized, which reinforces behaviors that don't build long-term capital. But all of this is to become skeptical of capitalism, of merit itself. It is to become skeptical of economic and social structures that are foundational to our country. The moral portrait it begins to paint is one of inequity, specifically that the privileged no more earn their place than do those without privilege. Inequity is not something you can simply "educate away". All the schools in the world and lack of racism is not going to fill the vacancies of landscapers, dishwashers, maids, cashiers, line-cooks, waiters and the rest. This is what I took West to be saying. Coates was his target not because he was black, but because he wasn't white. In the neo-liberal mainstream media world, critiques of capitalism are verboten, but lip service to racism is always fair game. And better yet, when a black writer like Coates, who so eloquently, poetically describes in rich detail the indignity of White Supremacy - yet without the deeper, revolutionary critique of capitalism, he is lauded. Much like the erasing of Dr. Martin Luther King's pivot to poverty allows modern Whites a sort of moral cleansing, Coates' wallowing in the pessimism of a neo-liberal framework unsatisfied with its own inability to come to terms with its perpetuating forces too abets a process of toothless political meandering. And while "woke" twitter throws shade over lattes and worn copies of bell hooks, people are still waking up at the crack of dawn to do dirty work for little pay. Race Counts is a great project. Its goal is to bring awareness of racial disparities across the state of California. "Through cutting-edge, rigorous research and analysis, RACE COUNTS will rank all 58 counties by these issue areas and provide a roadmap of how we can unwind generations of racial oppression.My package was marked delivered today, however I was at home all day. It was marked left beside door, however I have an enclosed courtyard, and there are no packages there." "a next generation, multiracial civil rights organization working on systems change. The staff in the California offices in Los Angeles and Sacramento work to expand opportunities in our educational systems, create healthy built environments and communities, develop the connective tissue of an inclusive democracy, and shift public investments towards equity." health care access, education, housing, democracy, crime and justice and healthy built environments. Information is broken down by ethnic group, population and county. It is 50% hispanic and 30% white. Highest employment levels are among Latinos. Highest graduation rate is Pacific Islander at 97%, lowest is black, at 72%. So, most of it is what you'd expect, with Black and HIspanic minorities generally bringing up the bottom of the disparity gap. Some surprises, however. White kids are actually arrested for truancy at rate more than doubling Black and Hispanic kids. However, while curfew arrest rates are roughly equal for Blacks and Hispanics, rates for Hispanic kids are more than two thirds lower. All well and good, but two things stood out to me. First, the rates across ethnicities aren't broken down by SES. For instance, how would high-SES blacks compare with high-SES whites? My guess is we'd still see disparities, but they would be vastly smaller. When you have a good paying job, a stable family, an education, and live in a nice neighborhood, things are kind of going well by definition. So this presents a problem. Emphasizing disparity by race is important in understanding historical context of racism, legacy of Jim Crow, immigration, redlining, etc. It makes a profound case for the present disparities being unfair and immoral. It thus demands action as a moral imperative. However, the danger in racial analysis is that, by emphasizing racial disparity, an easy narrative can form that racism is the problem. That is, if we simply ended racism, things would all get better and we would have equality. If teachers treated kids fairly, if employers looked past race, if lenders gave out loans without regard to skin color, these disparities would somehow end. But this misses a crucial element of how we have chosen to structure our society: the setting of wages in free market capitalism. You can treat people as fair as you want, but we will still have millions of low-skill occupations that need to be filled. In a free-market system, these jobs will pay poverty wages. If you look at pay scales historically for jobs in which repetitive, relatively simple and manually intensive labor is required - picking, scrubbing, folding, stacking, carrying, checking - you will find wages at the very bottom of the pay scale. The people who will take these jobs will be the most desperate, those with the least available options - the least education, the most difficult childhoods, the most mental and physical health issues, the most unfortunate family crises, etc. And when you require someone like this to spend 40 hours a week performing difficult, exhausting and depressing labor, and then only pay them a poverty wage, you create a perfect recipe for intergenerational poverty. To make matters worse, in a system of free-market housing, they can only afford to live in the cheapest homes. Voila! Ghettos are born. Apartment complexes, trailer parks, housing developments filled to capacity with poverty and struggle. But why stop there? Tie basic government services to a neighborhood income tax base, and things like roads, postal offices and libraries are barely funded. What about the children? Public schools in these neighborhoods will be filled with children who come from homes with vastly fewer resources. Lower education, higher stress, more dysfunction, and likely generations of disadvantage. Even the best teacher will struggle to make up for the cognitive, and emotional needs of their pupils. Federal programs like Title I try to make up for these disadvantages in small ways, like providing free and reduced lunches, counseling or maybe social workers to try and support the families. But they are for the most part band-aids that, while crucial and greatly needed, only serve to stem some of the bleeding. Schools try to innovate, but results are messy, and what appear to be effective interventions are often fleeting as success often requires a lot of luck and everything to be just right (above average leadership and staff, above average culture, above average... something). But by definition, above average is not scaleable. Charter schools have proven to be a mixed bag - well intentioned, but more often than not merely representing a selection bias, attracting only the most motivated families: by definition the very families in these communities whose children are going to be the most prepared. One feels for their plight - who doesn't want the best for their child, and every family deserves a good school for their child. But if the reason your school is not "good" is that it is populated by poor kids, and you live in a poor neighborhood, requesting a selective school is helping certain families but not solving the larger issue. Which, again, is poverty. Even in the best scenario - the one you hear again and again from those interested in "education reform", is that all these kids go to college. Great. But we still have millions of jobs that pay poverty wages. This is the great neo-liberal paradox: you spend/organize the perfect government intervention to get everyone an education and great jobs, yet millions of low-skill, low wage jobs remain. And OK, education is hard, not everyone is cut out for college. Maybe the answer is trade school. A plumber, carpenter or electrician can make a solid middle class wage. But you still haven't dealt with the problem. What if we really used our imaginations and somehow schools were able to get all kids graduated and into trade schools or college? So there then becomes this massive glut of highly educated/trained workers who can't find work. Yet there still exist millions of low-skill, low wage jobs. Are they going to all demand higher wages because of their fancy degrees and certifications? The maid, the fieldworker, the cashier is still going to be competing for a job, and will need to work... or starve. Degrees are poor leverage when everyone has one, jobs are scarce, and there's a line of willing workers lined up behind you. The sad reality is that unless we find a way to raise pay for the massive numbers of low-skill jobs that our society demands, we are going to have massive numbers of people living in poverty, necessarily in poor neighborhoods, with their kids going to poor schools. All you have to do is sprinkle a touch of historical racism and marginalization into the mix and racial disparity is guaranteed. These are all great ideas. But notice anything missing? How are any of them going to help raise wages for low-skill occupations? I would say they continue, but do not begin there. They begin in our embracing an economic system in which low-skill work is paid a poverty wage. This creates ghettos, destroys families and depletes capital (financial, emotional, cognitive, safety, health, transportation, modeling, etc.). Historically marginalized, low-capital ethnic groups will get caught in the trap of being forced into working these jobs, and thus sucked into a generational system of oppression as an underclass, as geographic isolation concentrates the effects of poverty, nowhere more so than in neighborhood schools. Dominant ethnic groups will find racism a convenient rationalization for the structural economic system which requires the dehumanization of fellow citizens in order to excuse their continued exploitation. Politicians and pundits will find that demogoguery is an effective tool to gin up support for their personal or political ambition. The way out is simple in theory, yet difficult in practice: raising wages for this type of work, thus detaching it from ethnic marginalization and geographic segregation. To truly dig out racism from society, we must go deeper, indeed to the root. After a 10 year career in education (Kindergarten, 1st, High School Biology, Earth Science) teaching at a variety of lower-SES schools, I decided my strengths lay elsewhere. I am now a practicing behavior analyst (BCBA), working primarily with families of children with special needs teaching appropriate behaviors, functional communication, play and social skills, and daily living skills using Applied Behavior Analysis, the science of human behavior.